SHANKHNAD.ORG: HYBRID AND HYDROELECTRIC CARS FROM TOYOTA/HONDA/TESLA,CHVY,NISSAN-GULF COUNTRIES TO GO POOR BY 15 YEARS. HYBRID AND HYDROELECTRIC CARS FROM TOYOTA/HONDA/TESLA,CHVY,NISSAN-GULF COUNTRIES TO GO POOR BY 15 YEARS. Toyota is bringing a game changer technology for cars that will run on fuel cells , and since there aren’t many moving parts — no cylinders, pistons, crankshafts, etc,how it works? In a fuel cell, electricity is produced from a reaction between hydrogen and air. First, hydrogen atoms are compressed and stored in high-pressure tanks, two of which are present in the Mirai, together holding about 11 pounds of hydrogen at 10,000 psi. The hydrogen atoms are sent through a platinum membrane that separates the electrons from the protons. Those electrons produce an electric current that powers an electric motor-generator capable of 151 hp and 247 lb-ft of torque. The newly liberated hydrogen protons are introduced to oxygen in the air on the other side of the membrane, which in turn creates water — about a half-cup per mile, says Toyota — which exits the tailpipe. To reduce costs, Toyota had to make the fuel-cell compatible with its existing hybrid system and the Prius’ nickel-metal hydride battery, so Toyota fitted a four-phase boost converter, bringing voltage to 650V. As with the Prius, this is used primarily to assist during acceleration and capture regenerative braking energy. Honda also revealed its plans to introduce two all-new models that can be charged from a wall socket: one plug-in hybrid and one battery electric vehicle. As with the turbo engine announcement, Honda was mum on any further details about vehicle size, shape, style or electric range of the new models, except that they both will be introduced “by 2018. 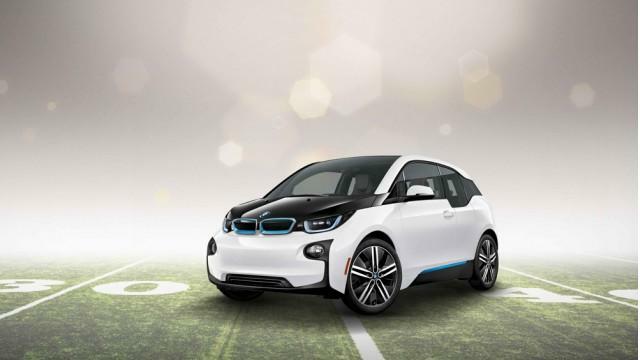 BMW is not behind also- For this year's Super Bowl XLIX (49, for you non-Romans), BMW will return with an ad for the i3 electric car. The 60-second spot will be the German automaker's first Big Game ad in four years. 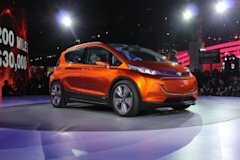 Nissan and Chevrolet are not behind.They are trying to increase range.Range anxiety" has always been one of the main concerns for buyers of affordable electric cars, and that issue is now receiving significant attention from automakers. This week's Detroit Auto Show included the introduction of the Chevrolet Bolt concept--which promises 200 miles of range at a price around $37,500. 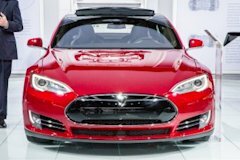 TESLA is bringing 3rd generation model-A "realistic range" of over 200 miles is also planned, and the car will have "strong performance" and batteries produced in the firm's upcoming battery Gigafactory--which should help keep the price of the new model down to Musk's target of around $35,000.